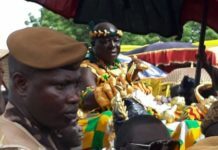 The Paramount Chief of the Techiman Traditional Area, Nana Oseadeayo Akumfi Ameyaw IV, has said the newly-created Bono East Region, including those of Techiman, Kintampo, Nkoranza, Atebubu, Amantin, Yeji, and Abease, will continue to show their appreciation to President Nana Addo Dankwa Akufo-Addo, for the creation of the region. 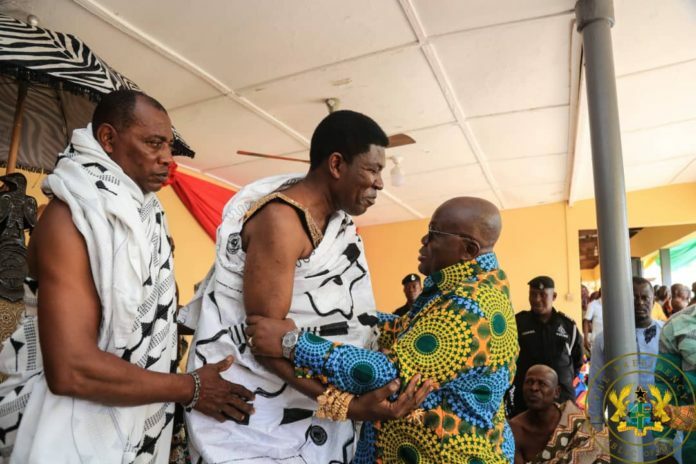 According to Nana Oseadeayo Akumfi Ameyaw IV, the chiefs and people of the region have always wanted the creation of Bono East, and are appreciative of the fact that it was under the presidency of Mr Akufo-Addo that their wishes were fulfilled. He continued: “If you say we should show him our appreciation next year, let us do so. I don’t want you to go and disgrace me, however,” the Omanhene added. 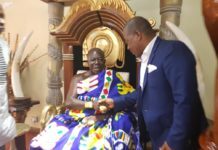 He made this known on Monday, 15 April 2019, when he held a durbar in honour of President Akufo-Addo at his palace in Techiman, on the second day of the President’s tour of the Bono East Region. Even before the full take-off of the Bono East Region, Nana Oseadeayo Akumfi Ameyaw IV thanked Mr Akufo-Addo for presenting eight new vehicles, comprising three Nissan Patrols and 5 Pickup vehicles, to the Bono East Regional Co-ordinating Council. 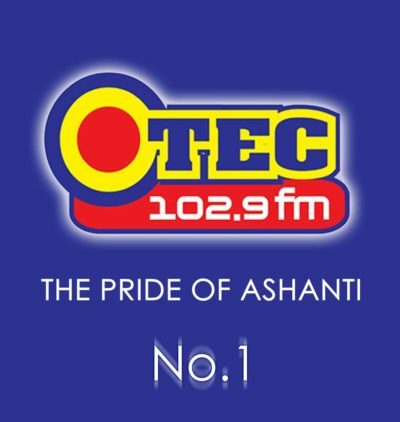 The Techiman Omanhene bemoaned the length of the mandate for Presidents in the country. “Some time ago, President Kufuor brought this issue up but Ghanaians did not pay particular attention to what he proposed. The four years of the constitution is not ideal for us. If it is possible, and Nana (Mr Akufo-Addo) would help us, something should be done about it to lengthen it, to say five or six years so that we can have adequate time for development,” he added.